It seems that now we have another mining pool for Ethereum available, what seems to be the third one actually. The new pool ETH Nanopool is also in a testing phase with a zero pool fee while in testing period and 0.01 Ether fee per payout with payouts made 2 times a day, the payout scheme used is PPLNS. Do note that there could be issues with this pool while it is in beta testing stage, so you might want to spread your hashrate between the two currently open for new miners pools and maybe even solo mining. 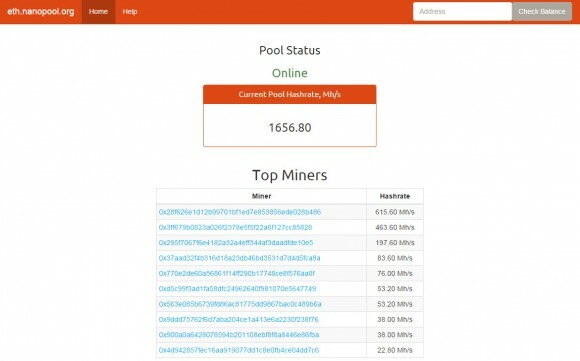 Ethminer works just fine with this pool and you can use our Quick Guide on How to Mine Ethereum on Windows to get started with this new pool. There is one important different that ETH Nanopool has compared to the other two mining pools already available and that is the lack of user setting for the difficulty. This should not be much of a problem for people with more hashrate, however for users with less hashpower this pool might not be a very good place to try to mine Ehther (ETH) coins. The above command line is an example you can use to get started mining with ethminer at Nanopool, you just need to replace the wallet address with your own Ethereum wallet. Since this pools does not support user setting for the mining hashrate (share difficulty) there is no parameter used for that in the ethminer command line, as a result it is not very suitable for miners with low hashrate as the default difficult may be too high. The above line is for mining using the OpenCL version of ethminer, for using the CUDA fork you need to replace the parameter -G with -U and you should be ready to go. I’ve mined to Nanopool about 12 hours with 60mh and it shows about 3ETH, then stats was zeroed and I have no payouts. There was a fork on the Ethereum network yesterday, so this may cause some issues and delays with transfers.